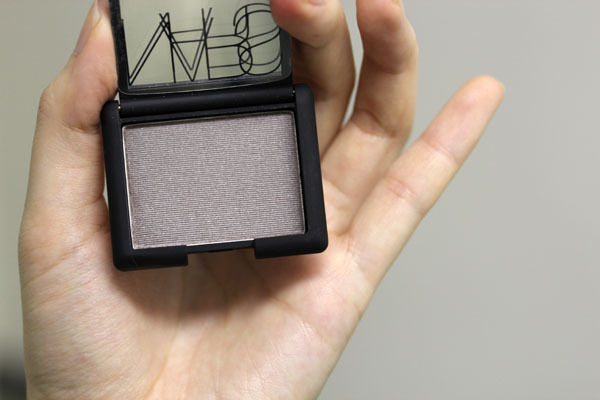 Nars Lhasa Shimmer Eye Shadow took the taupe-loving blogging world by the storm, and though the consensus is that it isn't actually a taupe, it's still a fine eye shadow to add to anyone's collection. What color is it? There's some gray, some mauve, some shimmer, a lot of people describe it as "lavender gray," and whatever it is, I'm not complaining. It's a shade I'll lump together with Lancome Erika F in terms of ease of use. Just this one color and you're good to go. Now, NARS eye shadow singles have a notorious reputation for unreliability, where quality can drastically vary from shade to shade. My personal heartbreak was seeing the beauty of Outremer in the pan but not being able to transfer it onto the eye. To my relief, Lhasa is not a problem child. In fact it might be one who excels in everything it does. For other views, Best Things in Beauty has a fantastic natural lighting swatch of Lhasa, while Cafe Makeup and The Non Blonde has comparison swatches for it. Now, I own Chanel Fauve and Safari, but I still consider it entirely worth it for the mauve-y goodness. NARS Lhasa Shimmer Eye Shadow retails for $24 and should hit your local Sephora and major department stores soon, if not already. I purchased mine at narscosmetics.com. Lhasa looks lovely - certainly not a problem child! Ahhh lucky you! I love the way you rock Lhasa and Mexican Rose! 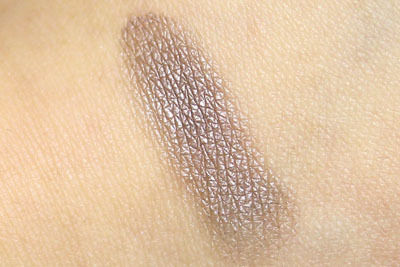 I have swatched Lancome Erika F, but it makes me look bruised (check my Twitpic if you want to know how disastrous that was)! I like Lhasa, but I'm not sure it'll work for me, so it didn't make its way unto my shopping cart last night (Paramaribo and Mexican Rose did). I want this so, so much. It looks gorgeous both in the swatch and on your eye. It is beautiful, but what do you have your lips? is it Mexican Rose? Gorgeous! I love it! All of these shades are perfection on you- lips, eyes, cheeks. Can't wait to hear how you would compare dior rosy glow (which I just ordered) with Nars gaiety (which I am about to). On another note, are you still using future skin regularly? I felt Luke my skin took a turn for the worse when I switched to it from Lmdb peau vierge. Could have been something else, however. Decided to try out perfection lumiere for a bit anyway. Hmmm not sure how that happened! Getting into my car now to run down to Nordies to pick Lhasa up. You are so fortunate that you can wear all the reds so well! LOOOVE this shade! And what are you wearing on your cheeks? C'est lovely! I love your lip color! is it mexican rose? What's on your cheeks? It's lovely. Sunny- Aww :( but I bet Paramaribo and Mexican Rose looked stellar on you! Project Swatch- teehee. Good thing it's permanent! katie- I stopped using Future Skin for winter. It didn't sit well on my skin for some reason. I've been testing out a new Chanel foundation (currently only available in Asia) and it's kind of rocking my world :x I'll be a sad girl when this sample runs out... should have bought a full-sized version when I went home. Another new chanel foundation? Hopefully it will make it to US so I can try it out. Think perfection lumiere is the best I've found so far, but definitely not perfect! Thanks! It's amazing how you make every lip color look fabulous!!! Mexican Rose is a gorgeous color. 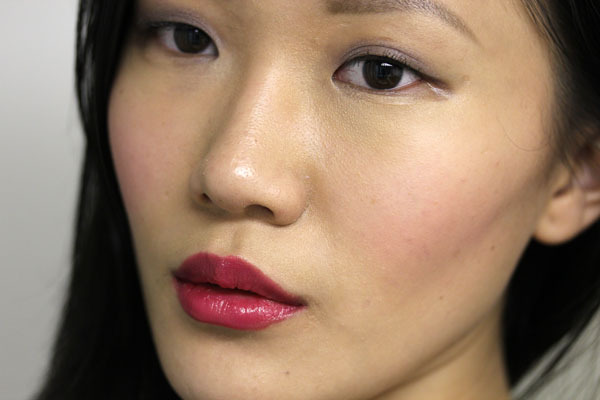 Lhasa is also lovely, but I feel it's too close to MAC's Shale for me to purchase (and I may be too olive-toned for it).